LAS VEGAS — A young Barry Trotz remembers taping his stick before the conversation that changed his hockey life. It was 1982 and he was at his first (and only) NHL training camp with the Washington Capitals. He was gearing up when he saw newly minted Capitals GM David Poile and director of player personnel Jack Button in the stands. Button, who spotted Trotz with the WHL’s Regina Pats, laid the compliments on thick. At this point, Trotz got all pumped up, envisioning himself as an NHL player. Trotz was gut-wrenched. A quick assessment from Capitals coach Bryan Murray, Trotz’s first junior coach in Regina, confirmed his fate. He hadn’t even stepped on the ice yet. Button saw the potential. He told Trotz to go get an education at the University of Manitoba and the Capitals hired him as a part-time scout for $5,000 per year. Nearly 36 years later, the man who couldn’t play – the coach they said couldn’t win – is one win away from a hockey life come full circle with the franchise that started it all. Trotz and the Capitals can clinch the Stanley Cup with a victory over the Vegas Golden Knights in Game 5 on Thursday night. No coach has won more games (762) in NHL history without his name being etched on the Cup. Despite the stakes, the Capitals say they have never seen a more relaxed Trotz. From skating the “hot lap” to reminding the assembled media to “hydrate” because the extracurriculars in Vegas (not the desert heat) to reenacting Patrick Kane’s “real smooth” Gatorade commercial, Trotz has been the picture of calm in front of the camera. When Button’s son, TSN director of scouting Craig Button, saw the video of Trotz’s lap around the ice in the Conference Final, he fired off a text to Trotz. Trotz howled when he read it. That mentality has rubbed off on his team. That Trotz is level-headed and calm is impressive considering he doesn’t have a contract for next season. He has won two President’s Trophies, averaged 111 points, and pulled down a .677 points percentage over these four seasons in Washington – but the Capitals have not extended his contract. Trotz, 55, has been an NHL head coach every season since Poile brought him to Nashville in 1998 as the Predators’ inaugural coach but it wasn’t a straight line to where he is now. 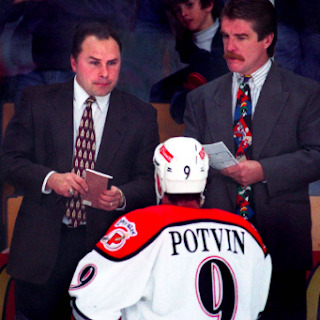 Trotz gave up coaching in the Manitoba Junior Hockey League be a scout with the Capitals. It wasn’t always glamorous. Trotz’s wife, Kim, left her bread-winning job as a dental hygienist in Vancouver so he could pursue his dream with the Baltimore Skipjacks. Two years in, Trotz thought he was being fired. He met with Poile on a Friday afternoon after a subpar season and Poile ominously led him into the weekend with “We’ll see. We’ll talk on Monday.” He survived with a little help at home. Trotz was ultimately promoted to Skipjacks head coach and moved with the Caps’ affiliate to Portland, Maine. He developed the kids, coached the complementary veterans, and the Portland Pirates won the 1994 Calder Cup. Trotz can become just the second coach in the 81-year history of the AHL to win both the Calder Cup and Stanley Cup with the same organization. Bob Hartley did it first with the Colorado Avalanche (Hershey) in 1997 and 2001. Poile will be watching to see if Trotz can hoist the Cup that has eluded Poile himself these 36 years. The only shame is that Jack Button, who passed away in 1996 after a battle with leukemia, will have to watch from above. Button liked to call Trotz his “favourite son,” much to the amusement of Craig and his brothers Tod and Sean. Craig said Jack would be “beaming with pride” see Trotz pull this off with his team. Trotz said he has often thought of Button these playoffs. He keeps a photo of the late Button in his office – a reminder of this crazy hockey life.